During vet school I explored all aspects of veterinary medicine: equine medicine, large animals, small animals, the various specialties, but working with wild animals and exotics captured my interest and I decided to become a zoo vet. Driven by my new motivation, I spent my summers and breaks during vet school volunteering at various zoos around the country. I also satisfied my love of travel by doing zoo externships in Singapore, Malaysia, and Ukraine. I never could have imagined what was in store for me. While most vet students learn to do their first rectal exam on a dairy cow, my first rectal exam was on a rhino! I also learned to draw blood from the head of a crocodile and the ear of an elephant. Despite these amazing experiences, I felt something was missing. It was while doing a rotation at the National Zoo and Smithsonian Research Center that I realized what was lacking: the human-animal bond. Even though it was my love of animals that motivated me to be a vet, I missed talking to pet parents, hearing them talk about their pets, and seeing their relationship. I knew then that I was destined to be a companion animal vet. Since graduating from vet school, I have worked as a companion animal vet in private practice and as a shelter vet. Private practice has been rewarding, especially seeing the bond between pet parents and their animals, but shelter medicine, despite its challenges, has given me a greater sense of fulfillment. Seeing the countless shelter animals in need of a home takes an emotional toll, but knowing that your efforts make a real difference in the lives of the animals you help makes it worthwhile. These experiences made me realize the need to reach a broader audience. About ten years ago I had the opportunity to do a pet segment for a local NBC affiliate. From day one I was hooked! Being in front of a camera was exciting, but more importantly, I quickly realized that television allowed me to reach a broader audience than I could as a veterinarian. In private practice, I could educate pet parents one pet parent at a time and reach out to 30 households in one day. By being on television, I could reach out to thousands of viewers in a matter of minutes. I also began to writing for various magazines, such as Cat Fancy, Bark, Kittens USA, etc. to spread my messages through print. Television and writing gave me the platform to address important pet issues, like shelter pet awareness, microchips, how to choose the right pet, the importance of screening exams, etc. Being a writer and media personality has become an important facet of my career. 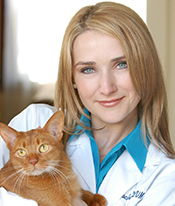 Known as Dr. Ruth, “the Pet Vet,” I have appeared on TV shows like “The Doctors” and on the TV news programs throughout the country educating pet parents about important pet issues, and as a writer for Cat Fancy, I have written hundreds of articles. Although I would never have predicted this development in my career, in retrospect, it makes sense. Being on television and being a writer has allowed me to fulfill my original motivation in becoming a veterinarian: helping animals, only on a larger scale and with greater impact. Follow Dr. Ruth MacPete on Facebook!